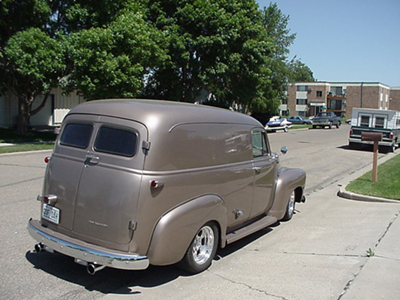 The full rear quarter panels for the 1947-55 Chevy/GMC Suburban were made all the same at the metal stamping manufacturer. To save money these panels were not made different if the Suburban was to have the double doors or the tailgate style opening in the rear. 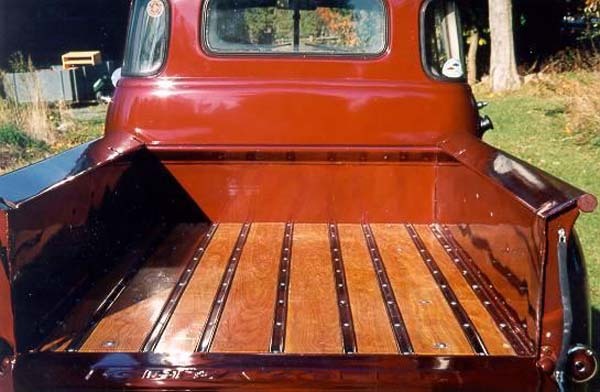 Thus, when the Suburban was provided with a lift and tailgate combination the 4 holes for the “double barn door” hinges in the quarter panels were filled with rectangular rubber plugs. This was not just for appearance but prevent rain water from reaching the body interior. 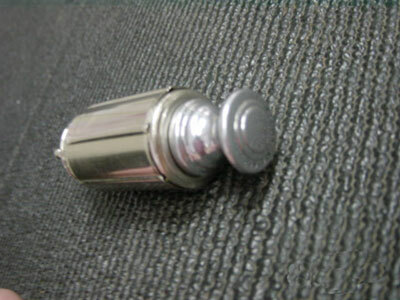 These photos show the plugs painted in body color; however it is questioned if this is correct. By 1950, Suburban buyers had the choice of the 12 pickup colors. It would have been more economical for all to have black rubber plugs instead of 12 boxes with the optional color prepainted plugs on the assembly line. The other thought: These plugs were painted when the full body was given its final color. This would mean GM planned on the enamel body paint being of the quality that would successfully adhere to rubber over the years. We don’t usually see this combination in other GM vehicles. Special paint for rubber only is used! We have always assumed that less than 100 Advance Design Canopy Express trucks remain. If you ever see one restored or not restored, you should stop and take note. They are a part of our nation’s history. They carried groceries in neighborhoods with one car families during the years they were built. The husbands drove the family car to work and the ladies were housewives. Grocers knew if they were to stay in business they must drive their Canopy Express to housing areas displaying and delivering food. 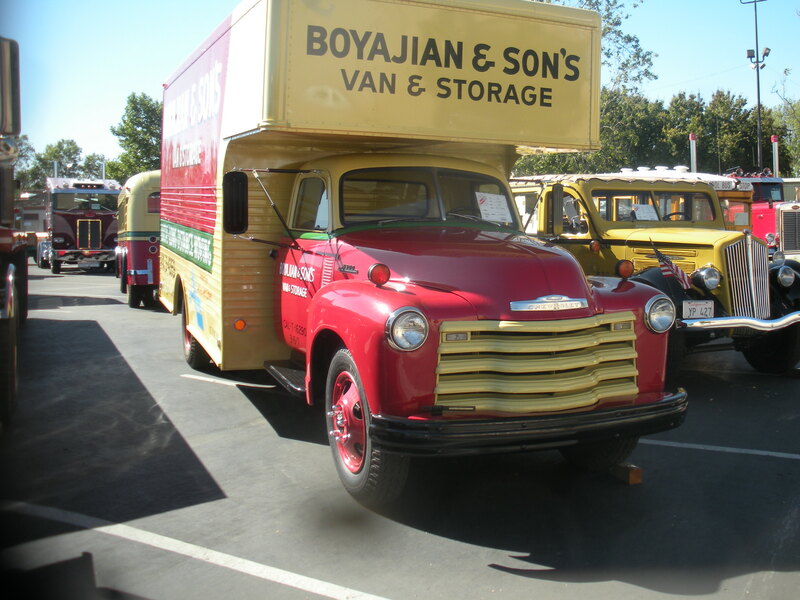 Our feature truck is probably the most complete and perfect restored example in existence! It is owned and has been restored by John and Michele Dunkirk of Southampton, New York. His desire to have a Canopy Express was because his first vehicle was this body style. In the 1960’s few people had an interest in this unique older body design as a used vehicle! Thus, it was the least expensive vehicle John could buy during his later high school years. After 2 years of use he sold it to an auto junk yard for $15.00. 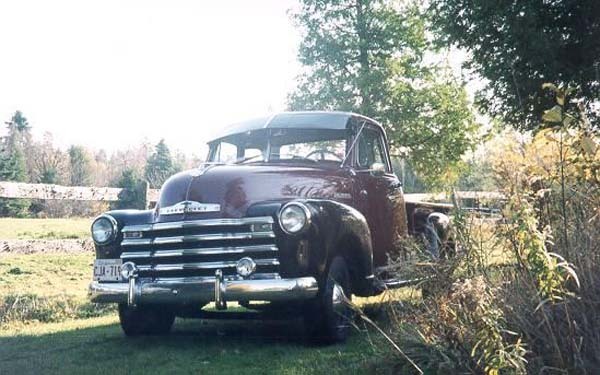 After completing restoration on a beautiful 1954 Chevrolet ½ ton about 15 years ago, (they still have it) John continued to think about his first vehicle in high school. The restoration bug had now bitten John and he wanted to do another Advance Design truck. Yes, he decided it had to be a 1947-53 Canopy Express. The problem, there were none! They were built for work and a first owner wanted them to look their very best doing neighborhood grocery marketing. Sad but true, there was almost no interest in a second hand Canopy Express. Within 5 years the wood and canvas side curtains began deteriorating. The wooden rear floor now stayed wet from rain and snow and mechanical maintenance requirements were beginning. The Canopy Express had reached the end of a short life. John’s several year hunt ended in Florida from a small magazine advertisement. The way the owner described it, made the truck sound like a real one! He drove almost 800 miles one way to see it. A great surprise, it was the real thing and a 1953. As he looked at the total package, it seemed so deteriorated! It would need it all and a little more. At the time, John thought this must be about the only one left in the world so the damage from age and abuse was overlooked. The restoration went “full steam ahead”. No nut or bolt would be left untouched. It was like building a large model kit after the parts were restored. They soon realized what a big project they were into, however there was no turning back. Otherwise only a pile of parts would remain for salvage. After almost 5 years including 500 hours in bodywork and painting plus another 1,000 hours in all the other parts of the restoration, the 1953 Canopy is now a “Work of Art”. It is one of the top attractions at all shows! The finished vehicle is now basically as it was when new. A great inline six cylinder motor is just broke in. Of course, the 4 speed transmission was a necessity on a Canopy Express. The low speed first gear was for slow moving through the neighborhood while displaying grocery products. 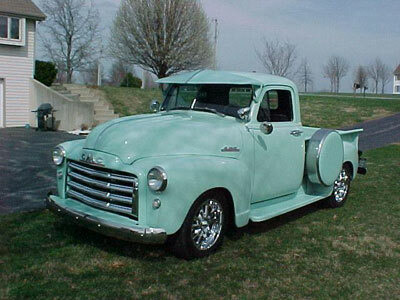 The paint is a correct 1953-55 Chevrolet truck color, Transport Blue. John added one change to the restoration, it originally had a single bucket seat. 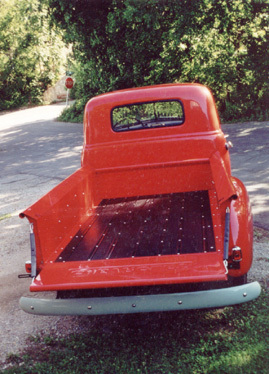 He used a full pickup seat, so he and Michele could attend distant shows together. 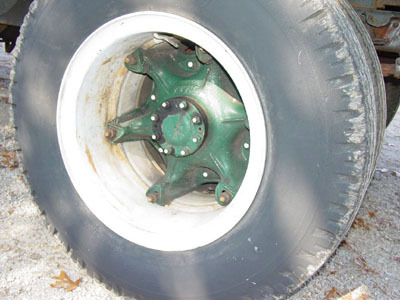 The white wall tires were a non-GM accessory but local tire shops could have installed them after the canopy was bought. This would make the truck more of an attention getter when selling merchandise in the neighborhoods. There are several large expenses “not” mentioned that aren’t included in the 1,500 hours restoration time. The most costly expense was the acquisition of a Canopy Express tailgate. John’s Canopy Express came with the tailgate missing! How could he spend so much time and money on this project and then be stopped without a tailgate? He had no idea this part would be so difficult to locate. He continued with the restoration assuming the gate would be found by the end of the project. It wasn’t. The Dunkirk’s hauled it to New England shows for 2 years after completion with no tailgate! No matter how hard he researched, there was no gate to be found. They even took it to Stowe, Vermont twice for the most attended antique car and truck show of the summer. It received second place in the commercial class for both years. Still no tailgate! On one summer weekend it was taken to the large monthly Hemming’s Car Show in Bennington, Vermont were it was placed in the top ten vehicles. Numerous local shows on Long Island, NY also saw this little canopy for the evening. Actually, part of the reason for many of the shows was to try to get a lead on a tailgate. Finally, a few years later another small magazine advertisement led to a tailgate. An un-restored complete Canopy Express with a tailgate was for sale in Southern California. The problem: John and his wife, Michele were in Southampton, New York. There was no choice. They flew across the country to see it! It was found to be well worn as John’s had been but it had a tailgate. As they arranged commercial transportation to New York, we assume John remembered he sold his first canopy to a salvage yard for $15.00. When it reached New York a few weeks later, John and his body man finally agreed and accepted the bad news. The inner tailgate panel had been beat so bad that the dings, tears, and holes made it un-restorable. Without this inner panel, there could be no tailgate. What a disappointment! What happens next? One day a lucky thing happened! 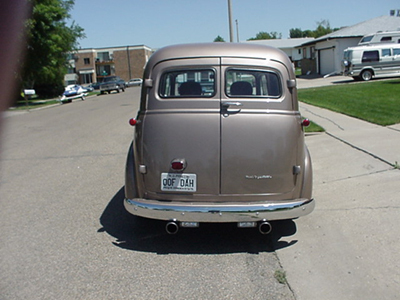 With research John discovered the tailgate from a 1947-55 Suburban is the same in the lower 2/3 as a Canopy Express. With almost as much effort as finding the Canopy gate, John finally traded for a damaged Suburban tailgate. A restorable inner panel was now in his possession. He could cut it shorter and make a new inside gate panel for his Canopy. The truck could be completed! Next project; Finding the artificial fruit and vegetables to display were the easy part. Locating mint condition grocery boxes of the 1950’s was another story. John and Michele attended many flea markets and garage sales. The boxes had to be of wood of the 1950’s and their colorful paper labels perfect. They soon found the best sources were estate sales. Most wood boxes and labels had survived because they had been put in attics and basements 50 years and used for storing merchandise. At these sales, John and Michele bought the boxes when they could and not the miscellaneous items they contained. Now that the total restoration is completed a big appreciation for help go to Trevor and Stephanie Mercer that worked side by side with the Dunkirk’s during the 500 hours spent. Gene “The Tool Guy”, handmade the many panels (body, tailgate repairs, and floor) to replace those so badly rusted. Reproductions were not available. During the 3 years it has been totally restored the Dunkirk’s are occasionally asked “What does it take to build a truck like this”. They quickly say “Just the money invested is over $50,000. This does not include the tailgate trip to California with return truck line freight, the drive to Florida to find the Suburban, plus finding the many distant flea markets while on a “grocery box hunt”. Then we come to the value of their time in the 5 year ground up restoration. Just make a guess of the investment! It all started with John’s first truck in high school. What a unique invention. 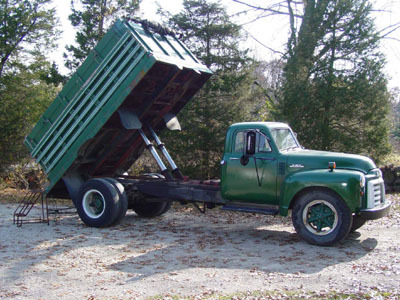 When you have a 1947 through 1959 single rear wheel 3/4 or 1 ton GM truck and need more pulling power, this is the answer. American ingenuity at its best! This new steel center hub extension includes eight long bolts to reach the original wheel studs. 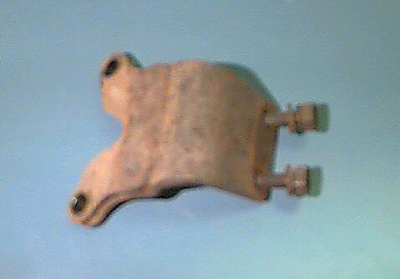 This holds the factory wheel in place and then provides a threaded end for the original eight lug nuts which are holding another matching wheel. The buyer of this aftermarket kit just had to be sure his new outer tire was the same height as the original inner tire. Pictures and data from Scott Golding, Stratton, NE. people each week helping with the many questions that come his way. of its current frame off upgrade. On my side of the story! from “Broadway Bob” at Auto Rehab. It was a project that took almost 1 1/2 years to complete. I started working on it from in a small 20×20 garage attached to my house . I was in the process of building a new 40×50 garage ! Most of the first few months were doing the work on it in my driveway, including disassembly, paint stripping, metal finishing, some bodywork and painting parts, etc. Due to no room in garage for the whole truck, it was quite a juggling show. The truck was in good restorable condition and thanks to Jim Carter parts! the job was possible to complete with new replacement parts. It was a complete frame off restoration. I reconditioned most of the parts that were in good shape and replaced everything that wasn’t. I made parts that weren’t available yet !! Every nut, bolt, screw, was reconditioned or replaced if bad ! I think it was my most enjoyable restoration in the past 5 years. Everything was taken apart, refinished and reassembled back to new. I was amazed at the quality of the vehicle construction when new . GM did an excellent job on design of this model truck. I think “that made it a thrill to work on”!! it was simple and effective, not cluttered like cars today!! 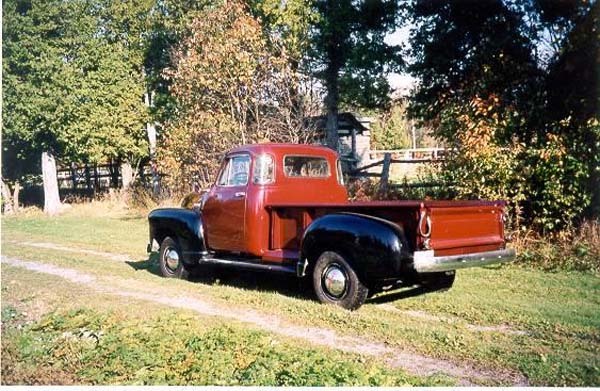 This truck was bought back in 1955 by the Baranek family in Crivitz Wis. This is the third generation of Baranek’s to own it and it has been in the family for 50 years along with the history and war stories told by son, grandson & great grandson, The truck was in good restorable condition considering it spent all its life in Wisconsin. I have had it for 1 1/2 years doing an extensive restoration of the vehicle and it was a pure joy to work on. It is currently owned by Richard & Lorie Baranek of Crivitz, Wisconsin, who are the 3rd generation owners of this restored 1953 Chevrolet 3600. Sorry we haven’t gotten back to you in so long. We have a daughter getting married tomorrow so things have been a little hectic. 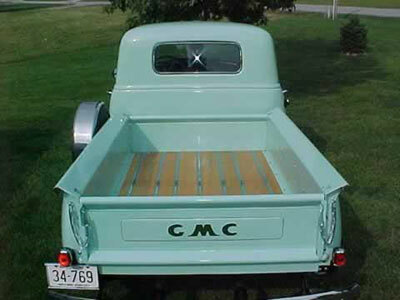 Our truck is a 53 Chevy I remember riding in it with my grandfather as a chilled. When my grandfather passed away the truck was handed down to my uncle who took over the farm . I thought he sold the truck until one day I discovered it in his barn and there it was sitting for 45 years. Now my uncle is 80 years old and it took me a whole year to try to convince him to let me buy it from him. I bought the truck for 100.00 dollars we got it running and used it just to bomb around in the back 40. After we were all done having fun the truck sat in the shed for 3 years and we finally found Bob to restore it. He worked on that truck for 2 years, then we went to see it. It was immaculate we’ve never seen something more beautiful. Bob did a great job on the truck!!!!! Purchasing a 1947-1953 optional cigarette lighter assembly from some vendors provides reproduction that is far from original in appearance. 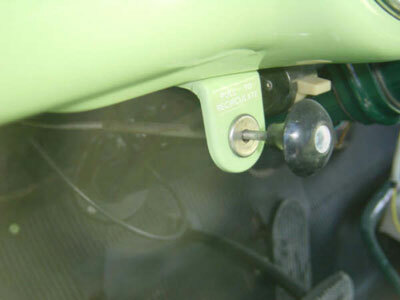 A manufacturer recently offered the optional lighter assembly but used a knob from the headlight of a 1947-1953. There is no similarity to the real lighter! Don’t be embarrassed at a show where your vehicle is being judged. With the introduction of the Advance Design Cab in 1947, a new dealer installed heater also became available. When used together this new body was referred to as The Cab That Breathes. 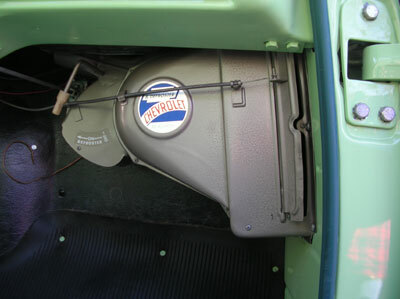 All U.S. manufactured Advance Design Cabs had a row of louvers on the right outer cowl which allowed air to enter the cab interior with the help of the new optional fresh air heater. It was a great improvement over prior years! As air was brought in from the outside it passed through the heater core. 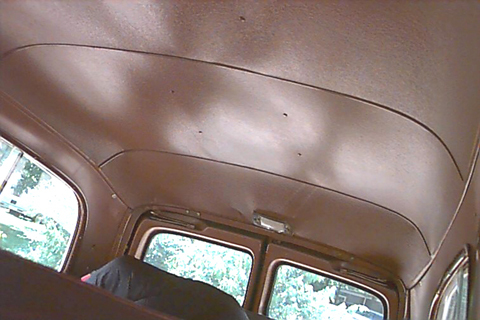 This warmed air usually held less humidity than air inside the cab due to the breath of passengers. The fresh, dryer, air helped prevent the inside of the windows from fogging during very cold days, thus GM said the cab breathed. This excellent heating system was made even better in 1953 with the introduction of the revised airflow heater. By pulling a knob, at the left of the steering column, a door inside the heater would cover the outside air intake. 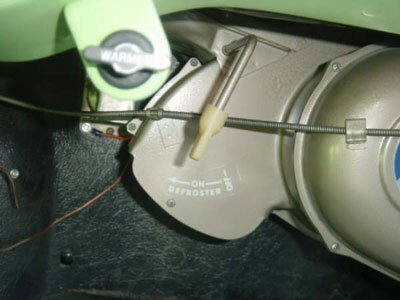 Now the heater was of the recirculator design. It pulled air from inside the cab so that inside air was re-warmed. Yes, humidity did accumulate quicker and windows could fog but heating the air inside was faster on a cold morning. Note these pictures of the improved 1953-55 fresh air heater. The driver operated cable was pulled and a door inside the heater shut off outside air. At the same time, a one inch wide door on the case opened to allow recirculation of air to occur. A non-related lever on the case directs the heated air to the floor or above through the defroster ducts. This ingenious idea by GM engineers now allowed the driver to have a cab that breathed or one that did not. Almost unchanged in 45 years! The second owner repainted the two doors to cover the town lettering, then added the “Moblegas” decals. Yes, the hubcaps, bumpers, and grill back splash bars are still the correct gray color due to 1953 Korean War shortages. 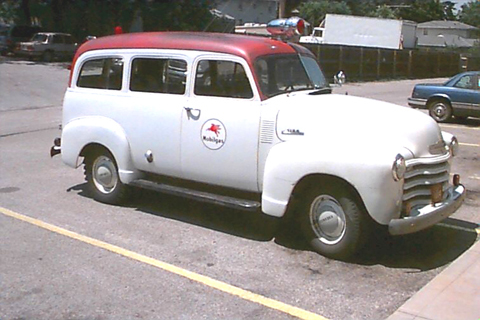 This 1953 Chevrolet Suburban was bought new by the City of Lamont, Illinois and was used as their fire department ambulance. It was for occasional medical emergencies but was usually found inside the town fire department building. This unusual work vehicle was taken out of service five years ago and had logged only 23,000 miles during its 45 years. 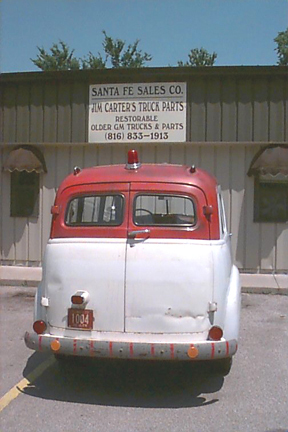 The original ambulance conversion in 1953 consisted of painting white over the original Juniper green, removing the middle and rear seats, adding red lights and a siren, plus attaching miscellaneous small extras that are part of ambulance necessities. 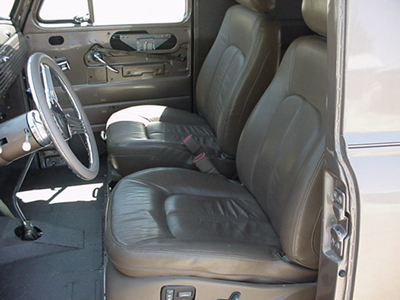 The Suburban interior (dash, front seats, side panels, headliner, floor mat, etc.) is probably the finest example of unchanged originality. This is the way General Motors sent it out from the assembly line. Inside storage and limited use has kept the interior colors just right including the maroon plastic handle knobs. Note the original tan floor mat to match the interior. (This colored mat was discontinued by GM’s parts department about two years later.) 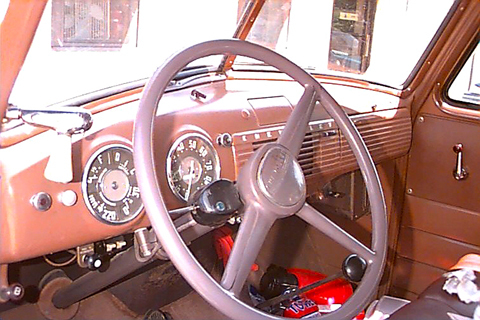 The dash lacks the stainless glove box door and trim as was normal during the Korean War shortages. Even the inside window frames (painted separately from the body) are a different shade and shine. 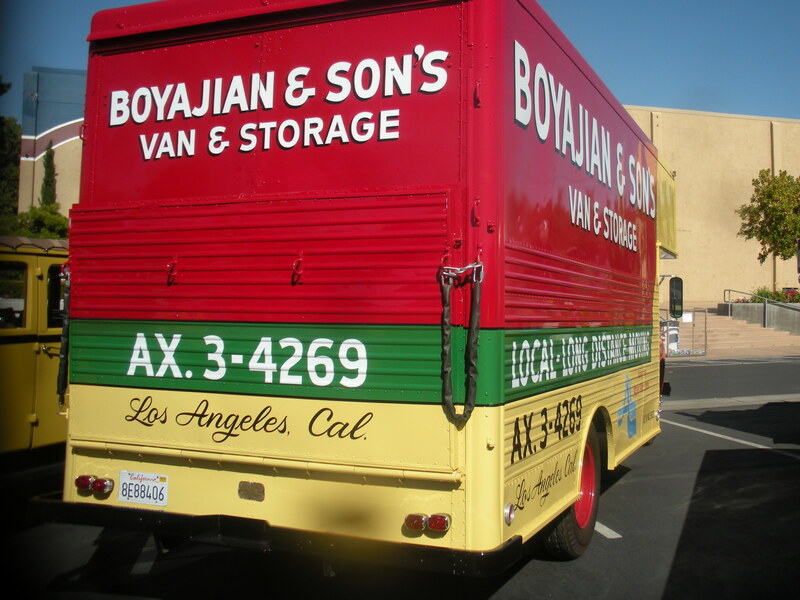 In May 2002, this gem was purchased from the second owner by John Heller of South Pasadena, CA. He recently completed the trip to his California home after driving it from Chicago on the famous Route 66. 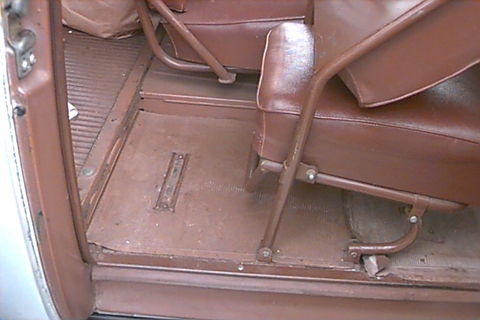 Passenger jump seat including original brown floor mat and rear floor linoleum covering. Original untouched five piece headliner. Note: Rear dome light is the same as above the drivers seat. The 1953 dash! Red brown paint and gray brown steering wheel paint are just right. Minor damage for almost 50 years as a work vehicle. Chevrolet introduced their basic nine inch single disc clutch and corresponding diaphragm pressure plate in 1938. This pair was used in their cars and most 1/2 ton pickups with three speed transmissions through 1953. With about one million of these vehicles sold annually, one can quickly realize the high numbers of this clutch system that was at one time on the highway. Even in 1954 with the introduction of the larger 10 inch clutch disc and modified pressure plate on the new 235 six cylinder, the original design continued to sell very well as aftermarket replacements. Today, they still have a strong demand even though the majority of these over fifty year old vehicles are history. Most auto part stores now keep a pair in inventory for their walk-in customers. To add even more validity to this clutch’s durability, GM reintroduced it in the late 1960’s. General Motors was a major producer of full size passenger buses and the demand for most having the optional air conditioning was becoming strong. Almost all new buses would now be equipped with the option. 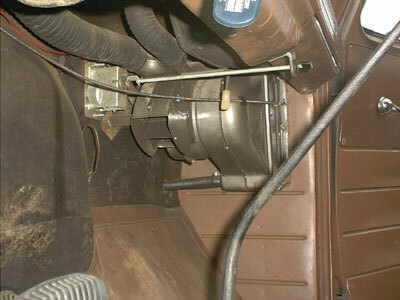 The original small nine inch clutch was combined with the newly engineered large bus AC compressor. 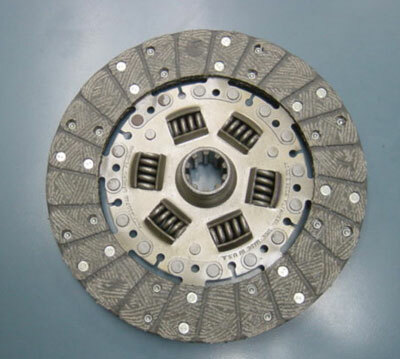 Once again, this proven clutch was serving automotive needs! Therefore, if you find a source for new or core clutch assemblies used from the late 1960’s to at least the mid 1970’s in GM buses, they will also fit 1938-53 cars and small trucks. 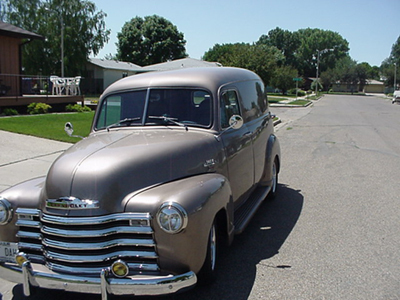 A redesigned parklight assembly was started with the introduction of the 1947 GMC advanced body style. It was placed in the front fender 3-1/2 inches below the headlight ring. A 2-5/8 inch diameter bezel held a domed glass lens to its housing by two barrel screws. The unit was not meant to be a combination turn signal and parklight assembly and held a 3 candle power single filament 6 volt bulb. 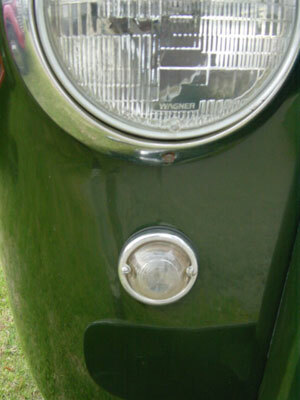 As with other car and truck parklights prior to 1968, it did not operate when the headlights were on. This round lens and chrome ring soon found other uses. They were placed on the parklights of Chevrolets new Corvette sportscar between 1953-1962! The ring also held a different lens to the rear of certain GM cars when they had the optional backup light assembly. 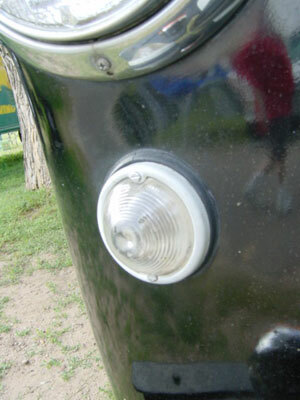 During 1952-1953, GMC used an enlarged parklight assembly only different than the 1947-51 unit in size. Dimensions were increased to 3 inches diameter to give more light area. It fit in the same front fender location and the securing ring was now painted white as was most other 1952-53 GMC trim during the Korean War shortages. This larger glass was shared with several larger GM cars as their parklight lens. The same rings, however, were chromed. These chrome rings were also used to hold a different clear lens on several GM cars for their back up lights. When observing restored 1947-1953 Advanced Design trucks, we rarely see the removable dash parts painted correctly. Though at least half the owners paint these parts to their personal taste, many truck restorers want the dash appearance as original. Surprisingly, we rarely see two alike even on trucks that are said to be restored just like they left the factory. The following is factory correct! 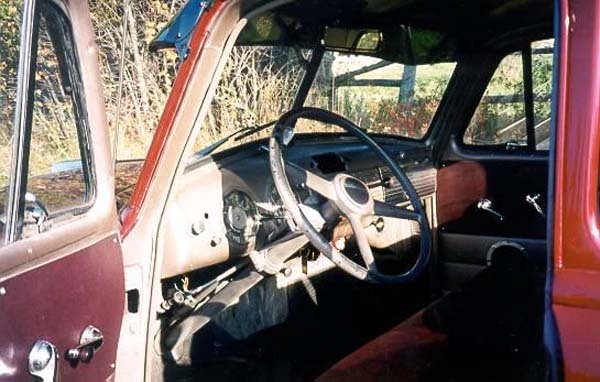 With a little extra effort your dash can look just like what the original owner saw 50 years ago. This is the early years of the series before the Korean War shortages. At this time, chrome and stainless steel trim was used more abundantly. The glove box door has a stainless outer ribbed skin and the upper and lower speaker grille horizontal trim strips are stainless. To create the original look, polish the speaker grille trim plus top and bottom wide glove door ridges to a mirror finish. Paint the speaker grille, ash tray cover, plus the remainder of glove box door interior cab color. Now comes the detail work. Cut masking tape the width of the valleys between the smaller ridges. Put in position after placing the tape on your pant leg to reduce the sticky surface. You don’t want to take the paint off when you remove the tape later. Next comes the silver paint. This is placed over the small ridge tops on both the speaker grille and glove box door. The result is similar appearing horizontal ridges nicely running between the two dash items just like GM produced them. These are the years of the Korean War shortages. 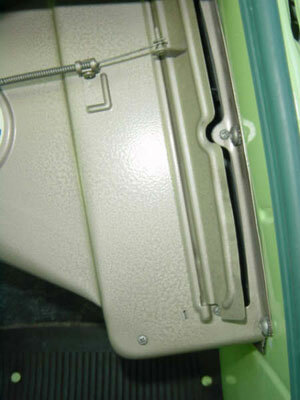 The glove box door, ash tray cover, and horizontal radio speaker grille trim were stamped from earlier tooling, however, were now changed to painted steel. They are all interior color and there is not even silver paint on the horizontal ridges. Therefore, if you have these years, restoration is easy. Just paint these items cab interior color and your job is done! 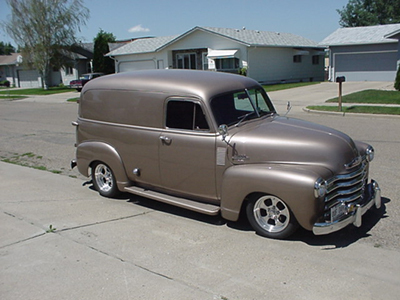 NOTE: The following image is from a 1953 Suburban which has the red and brown interior. 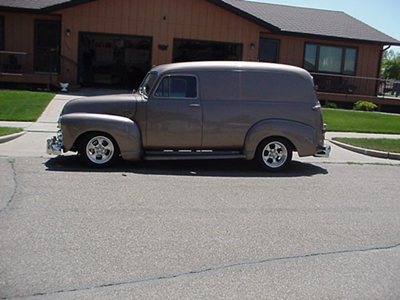 The pickup has the more metallic medium brown interior paint which will be like this Suburban except for the color. 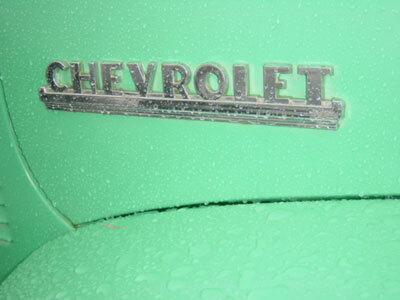 During the Advance Design years no less than four different Chevrolet hood side emblems were used on 1/2 tons. 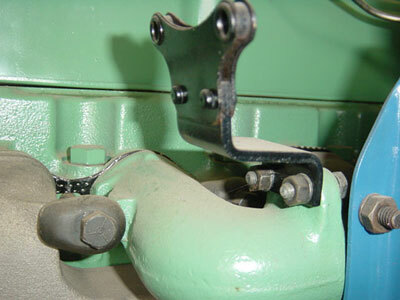 Each of their two mounting pins are in the same place so the punched hood holes were unchanged during these years. All were chromed die cast even during the 1952-1953 Korean war chrome shortage. The following pictures show the correct emblem for each of the years. Beware, some vendor’s catalogs do not list them correctly. 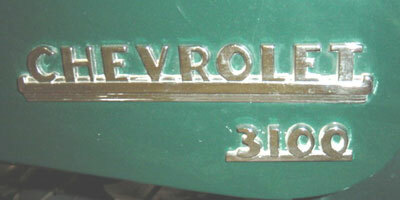 Note: Between mid-1949 through 1951, a separate small 3100 emblem was placed below the Chevrolet letter plate. Therefore, hoods during these years will have two additional factory punched holes. 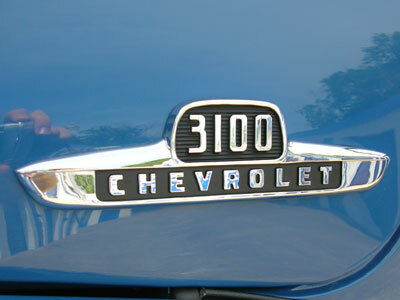 The longer Chevrolet emblem used between 1949-1952 are the same. 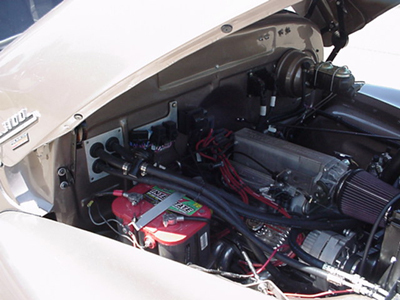 In 1953 Chevrolet/GMC trucks adopted the more modern relay activated horn. To keep cost low, GM used the same seashell type horn that had been on Chevrolet cars since 1949. It displays the number “689” in its die cast metal. In the Chevrolet Master Parts Catalog, the number when ordering a replacement was 199687. 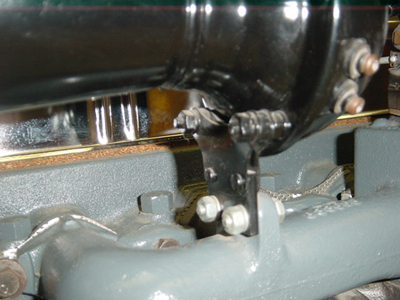 Though the 1953 truck used the existing car horn, GM created a special right angle bracket to attach it to the small extension on the iron intake manifold. This bracket has become very rare today. 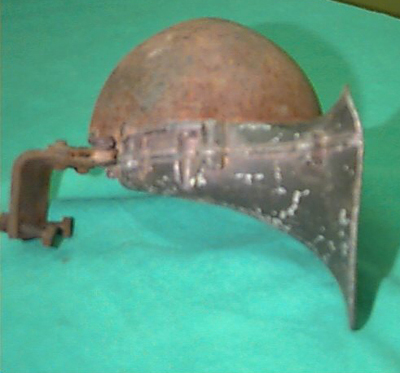 Most people incorrectly think the 1952 and older horn should attach to a 1953. Just right on a 1953! 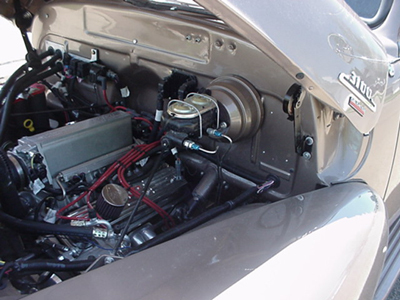 The horn location on the intake manifold of the Chevrolet 216 six cylinder changed position with the addition of the accessory oil filter. This oil filter was attached to the front of the intake manifold. 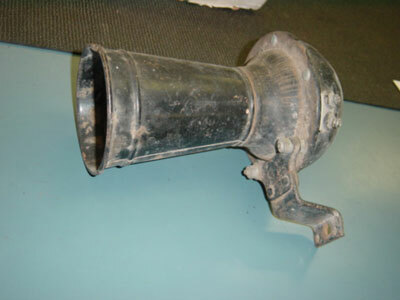 A special shaped horn bracket was necessary to move the horn forward away from the filter. 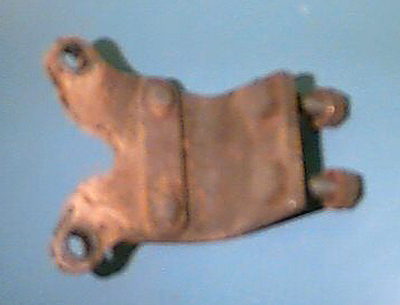 This bracket was included in the box with the new oil filter package. 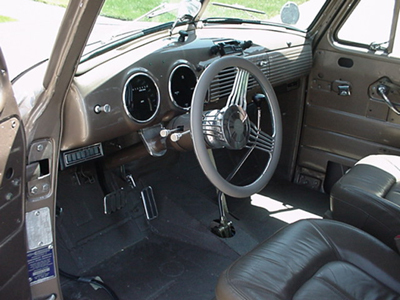 From 1947 and older, even the 3 speed transmissions shifted on the floor. There was no column shift. Without a shift box on the steering column, the oil filter could be placed on the rear of the intake manifold. Thus, the moving of the horn forward does not apply during these early years. 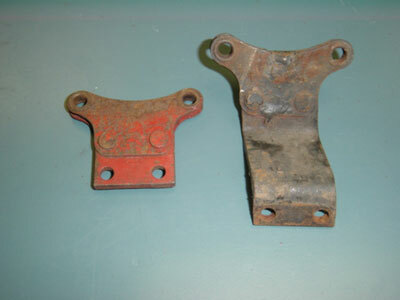 The attached photos show the two styles of horn brackets used between 1948 and 1953. 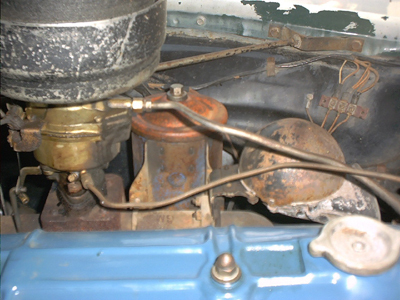 On 1954 and newer the horn is attached to the radiator support. In the 1953 Chevrolet truck accessory book, there is a charging bull head displayed as an optional hood ornament. During my past 20 plus years in this hobby, I have heard reference toward this accessory but have never seen an example or heard of another person seeing one. Does a reader have one? Has anyone seen this option on an original truck? Did this ornament actually make production after the 1953 booklet was printed in late 1952? 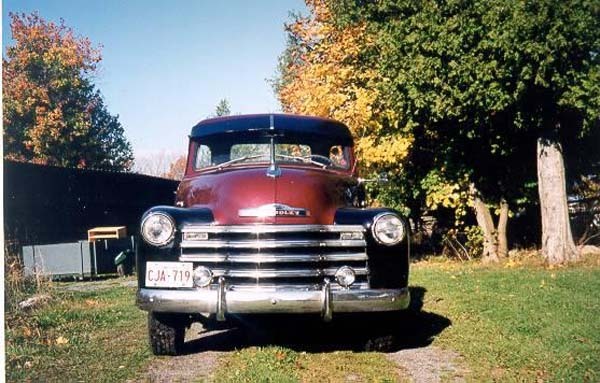 Between 1947-1953 the Chevrolet 1/2, 3/4, and 1 ton grilles were made from the same tooling. However, the paint colors and some with chrome plating made a difference. For the perfectionist, the following data will help you build a correct grille during your restoration. The standard grille has inner and outer bars the body color. Horizontally, a pin stripe is run on the edge of the five outer bars. It is the same color as the cab stripe. Standard grillexs have outer bars the body color without a horizontal stripe. The inner back splash bars are Waldorf white. Outer bars on standard grilles are the body color as prior years. The back splash color changes to Thistle Gray (light gray) to match the newly introduced gray hub caps and bumpers due to Korean War shortages. The deluxe grill has the five outer bars in chrome. The four inner bars remain the cab color. Chrome grills for these years are plated on the outer bars. The back splash color remains the same white as the painted grill. 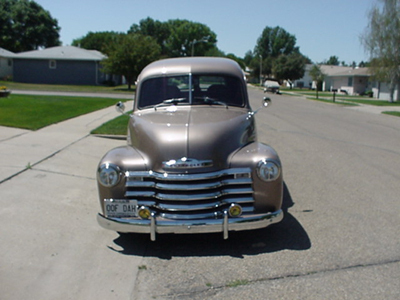 Chrome grill bars were not available due to Korean War copper shortages. Thus, these grills are the same on deluxe and standard trucks. The two outer vertical bars touch the fenders and are therefore their color. Unfortunately, the reproduction grilles are easily recognized at shows because the owners have not often painted their outer bars fender color! The three smaller inner vertical bars are semi-flat black. This prevents them from being easily seen when viewing the vehicle at a distance. NOTE: We see no reference to chrome outer bars being offered during the 1947-53 Chevrolet Advanced Design years. On first glance, most people assume that both Chevy and GMC gauge clusters are fully interchangeable and are the same except for perhaps the minor difference with Chevy oil gauges topping out at 30 psi versus GMC gauges maxing out at 60 psi. But that’s quite a bit short of what the actual differences were originally! There are actually no less than five distinct differences in the same year gauge clusters when taken from same size trucks. 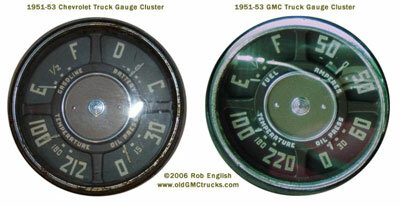 Below you will see two examples of late 1951 to 1953 gauge clusters; one on the left from a Chevy truck, and the one on the right from a GMC truck. Before you start jumping up and down about the tan background brown letter gauges in 1951, realize that the gauge clusters changed in late 1951 and then stayed brown background cream letters up through 1953. The first and most obvious difference is the oil gauge, but upon closer inspection you’ll find twelve distinct differences between them; six on each gauge cluster. So the next time you’re shopping for gauges, these subtle differences may help you to better understand what you need whether you are driving a Chevy or a GMC. This 1953 GMC 1/2 ton is certainly one of the more special trucks we see at today’s shows. It not only is of interest to people now but would have been a definite attention getter in the 1950’s. 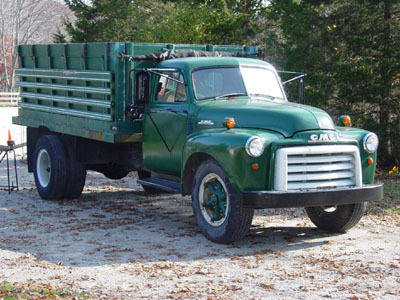 Jerry Willis of Independence, MO bought this farm truck un-restored in 1995 and is the third owner. He found it in South Missouri so it had not experienced winter road salt. It was a great candidate for restoration. 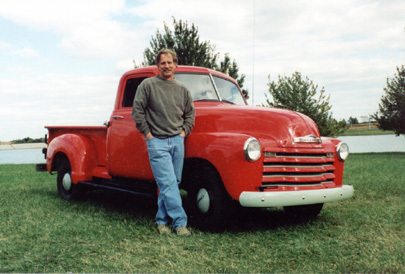 Jerry personally restored the truck including the body work, final paint, and refinishing of the bed wood. 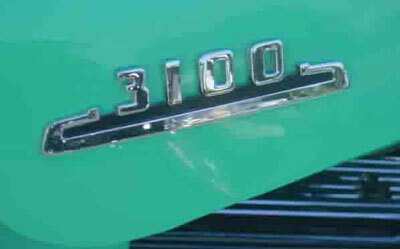 Its many little extras were added to make it look like a more custom truck you would have seen 50 years ago. Therefore, the transmission, brakes, and rear end are just like they left the factory. Even the “bullet-proof” closed drive shaft system that operated so well during its working years is still in place. 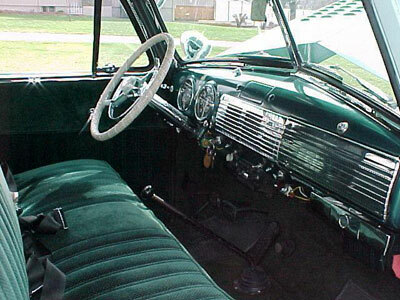 The mint green custom color of the 1950’s, louvered hood, Fulton sun visor, carpeting, cloth interior, and deluxe 1950 car steering wheel were also added by Jerry. The new 18″ chrome wheels and radial tires are one of the few items that is more modern. Soon after the GMC was purchased, a connecting rod of the original 228 engine came loose from the crankshaft and cracked the block! 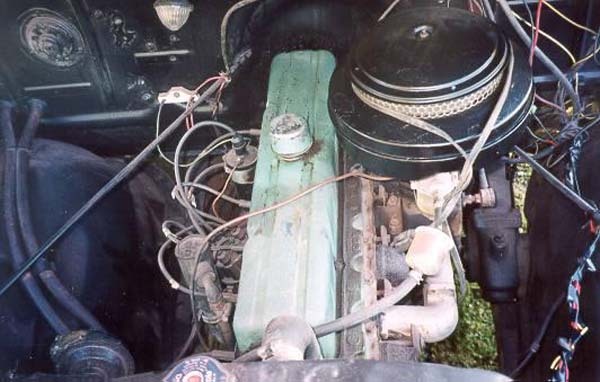 During his hunt for a replacement engine, Jerry discovered that the larger 270 GMC engine of the late 1950’s was an exact fit in his 1/2 ton. The rebuilding cost was about the same but the horse power would be greatly increased. 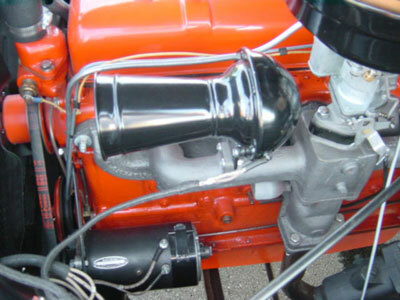 For better engine breathing, a pair of Fenton exhaust headers were also added. The total package is about what your would have seen in custom auto magazines and in auto shows during the 1950’s and 1960’s. 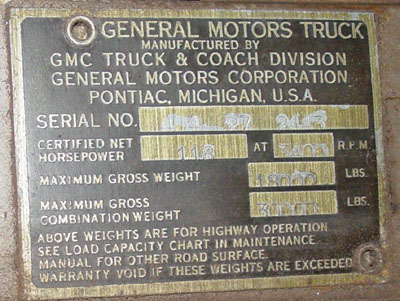 The greater power is also like performance GMC’s were built with 50 years ago. 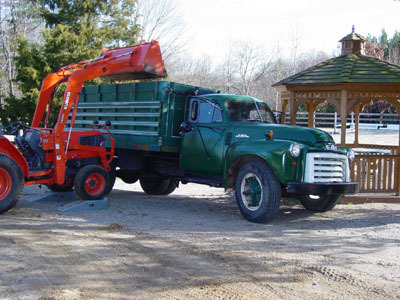 I note the absence of GMC participation on the featured trucks so I though that I’d send in some photos of my current project: a 1953 GMC 400 series with livestock body and twin double telescoping hoist. I bought this truck on eBay last year and was skeptical that the stated original miles were 5,000. Upon receipt of the truck, I was amazed to find that it was indeed the correct mileage. This truck was in service as a fire foam truck at American Cyanamid’s chemical plant in Bound Brook New Jersey from it’s original purchase in 1953 until the early 90s when the plant closed up. 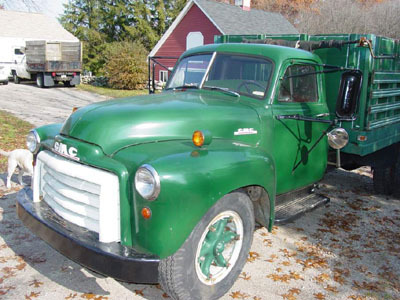 It was then sold to a local nursery at auction and the new owner pulled the fire apparatus off the back and then installed a livestock body and hoist off a larger 500 series GMC truck that he found in a farmer’s field. The larger 500 series had a shorter body by a few inches and also had a Clark five speed transmission. 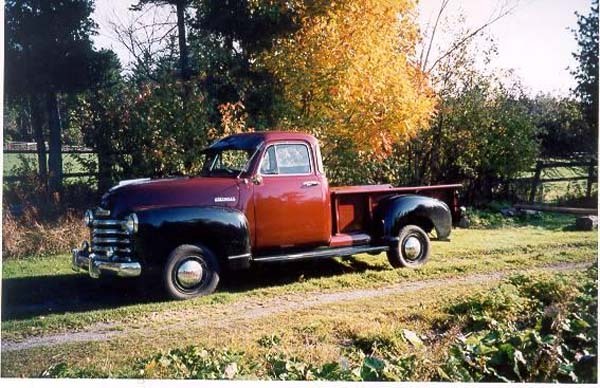 While GMC did not offer the Clark 5 spd in this model in 1953, the owner found it a lot easier to simply fuse the 500 series transmission, body, and hoist onto the 400 series than to try to make the existing SM420 4 speed and pump work. The result is a truck that will pull down a 300 year old oak and can haul up to 20,000 lbs. of weight but will not win any speed contests. I have relied on Jim Carter Antique Truck parts for all the needed parts for this truck, as I have in the previous five GMC projects I’ve done over the last 15 years or so. Thanks to Sheba Queen and Jim for being there with those parts that we could never find in a lifetime of searching. I wonder if anyone at Carter has ever tried to calculate how many old GM trucks have been born again thanks to your parts? This panel was purchased by me about three years ago in Calgary, Alberta. It was a Police Paddy Wagon there in its previous life. I’ve added a Mustang II IFS, a Crate Ram Jet 350, 700R4 Transmission and a four bar coil over rear suspension with a 9″ Ford (Auburn Posi – 3:50) rear end. I also have a Lokar shifter and parking brake, an Ididit Steering column and Dakota Digital Guages. The seats came from a 1998 Blazer. I’m looking forward to installing my most recent purchase from Jim Carter, the headliner and arm rests, along with the rest of the upholstery, which I will fabricate. Well this truck has a really long story but I’ll try to make it short and sweet. It all started with a trip to my wife’s cousin’s farm in Kentucky . We were looking at some of his horses when I saw this old truck next to his barn. I thought to myself, “I sure would love to have that old truck”. At the time, I didn’t know what would be involved in restoring it. So I asked him if he ever decided to sell it to let me know. About a year later I got a call from him telling me that he had painted it and was ready to sell. The next weekend we drove four hours to Kentucky from our house in Dayton , Ohio . When we got there and checked the truck out we realized that even though it was painted it still needed painting and restoration. Needless to say he wanted way too much for the truck. Fortunately for me they like to do a lot of trading. And I wanted the truck something awful. We ended up trading cash, shotgun, old video camera, and a old lawnmower for it. A few weeks later we had it hauled to our home. 1. To sell everything and get what I can out of it. 2. Take it as a hobby and restore it myself with no certain time frame. I kept envisioning what the truck would look like finished. So I decided to restore it. By the way I had never restored a vehicle before. Let alone bodywork or welding. I bought some books, and used the internet a lot. I bought a wire welder, compressor, and other misc. tools. Now, for what I did to it. First I sent the engine out to Performance Clinic for a rebuild. Put a 72 Nova rear end in it with 3/4 spacers on each side. And 4″ lowering blocks welded to the axle. Kept original front straight axle and removed 2 springs and put poly liners between the rest. The body needed the most work. I cut out a lot of rusted metal and patched it. Did the body work priming and block sanding. I then got every thing ready for paint. I did paint the firewall so I could put my engine in. Oh and in between a lot of the steps I ran out of money. That’s why it took 4 1/2 years to finish. I started it in 1996 and finished spring 2001. After I got it from the painter I started to put it back together. In 4 1/2 years I had collected a room full of stuff to put on it. The last thing I did was put a new wooden bed in it. I bought some poplar wood, routed the edges, put new bed strips down, and it was finished. Well probably not. I’ll probably always have something to do to it. Well I tried to keep it short. I’m sending a few pictures with this. Here is my 1953 Chevrolet 3/4 ton. I have just about completed my restoration and I have been driving it to work everyday. I bought it two years ago for $6500.00. It was very stock and solid with only minimal rust. It was originally green but had been painted burgundy/black over the years. I really liked the colors so I decided to go with a popular Chevy color, Garnet Red Metallic/Black. This truck is 3 speed, 12 volt and has a 261 motor which was swapped at the dealership. 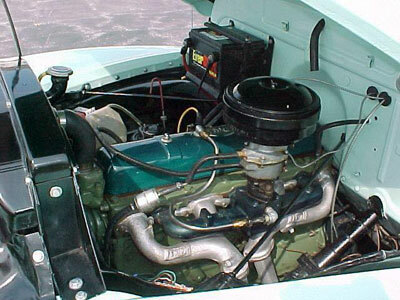 Early 50’s Canadian Pontiacs had 261s and there was often demand for these more powerful engines in the Chevy trucks. As long as you could find a willing Pontiac owner (or Dealer) you were able to get the swap (for a little money). Having a 261 is great, this truck has all the power it needs. I did a fairly extensive restoration, buying all parts from Jim Carter’s and relying on the help of Jim Carter’s staff, Stovebolt and local (older) mechanics. The new bed wood is Juniper which is a hard softwood. I thought about Oak but the Juniper only cost me $50.00, the end result is great so I have no regrets. I don’t know where the sun visor came from but I like it. To finish off the truck I am hoping to tidy up the wiring and the motor and add in a faster pumpkin to the rear end. These older 3/4 tons have a 4.57:1 gear ratio and I want something that would allow me to drive at highway speeds. It is an easy fix (1967-1972 Chevy c20 pumpkin fits right in) so I’ll get at that over the winter. Other than that I think the only thing this truck needs is some tidying up in the interior. I did paint it but I wasn’t happy with the dash so I think I’ll do that again (and get a radio as well). This truck has been restored to reflect its original character and I have added chrome and a few extras that I think help to make this truck a real classic. Although I love this truck it is going up for sale, I have decided that my next project will be either a 1947-1953 Suburban or 1946 GMC 1/2 ton. This month we feature a very special truck. 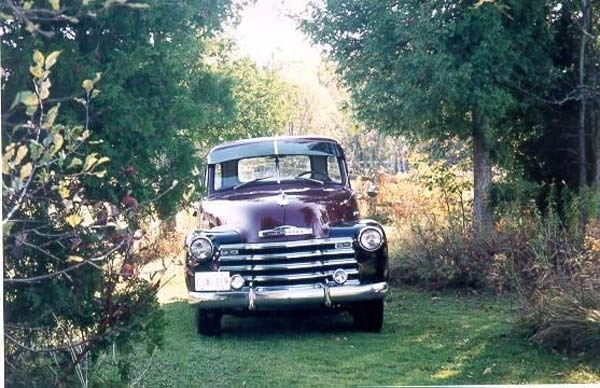 It is no doubt one of the few pristine examples of a pure 1952-1953 Chevrolet 1/2 ton in the U.S. today. Owner Bob Tucker of Prairie Village, Kansas resisted all temptations during restoration and demanded that the body and trim be just like the showroom models in 1953. What makes this truck stand out in a crowd is Bob’s attention to detail in keeping the trim painted as original and not chromed. During the 1952-53 Korean War years, copper (an important component for quality chrome plating) skyrocketed in price. Even shortages occurred. To keep costs down, GM eliminated most chrome plating on their trucks and the copper that went with it. Thus, this featured truck’s bumpers, hub caps, and grille back splash bars are Thistle gray. Even the front hood emblem is stainless steel and not chrome plated steel as in earlier years. This truck’s unique appearance is also reflected in the interior. 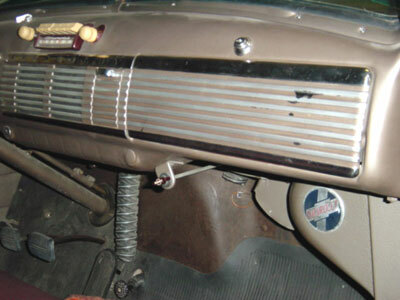 As is proper for 1952-1953, the chrome die cast knobs were replaced with maroon plastic. This includes those on the window cranks, wiper switch, and ash tray. 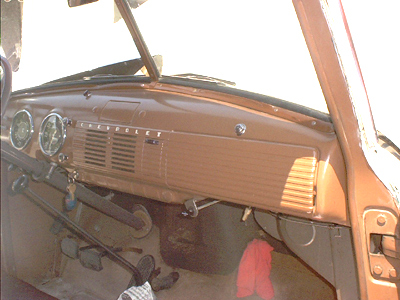 The two radio speaker horizontal dash trim stripes and glove box door are changed from stainless to painted steel. 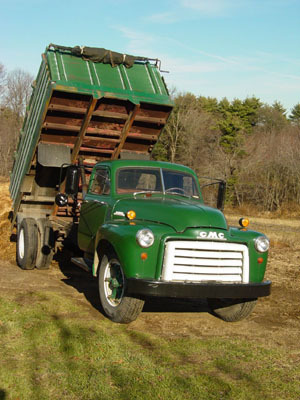 Today, very few 1952-1953 GM trucks are restored like the almost one million produced during those years. They are given non-original chrome grilles, deluxe wheels, stainless bumpers, varnished bed wood, carpeting, cloth seat covers, etc. 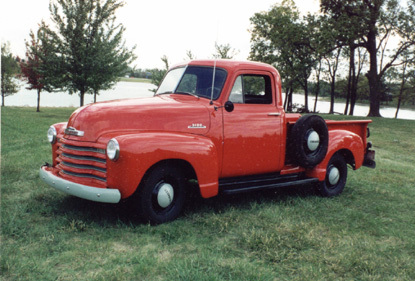 Our featured commercial red truck is a correct example of how we would have bought a new Chevy truck during 1952-1953. GM dealer installed accessories are the radio, fresh air heater, and right taillight. 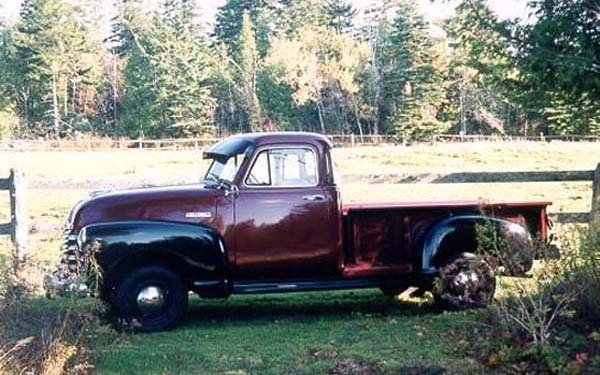 Congratulations to Bob Tucker for recreating a 1953 Chevrolet 1/2 ton “just right”. I would like to express my sincerest appreciation to Jim Carter and his staff for their patience and help in walking me through the Chevy parts minefield. Without them and Jerry Rivers, Owner of Body Shop 352, the completion of this project would have been unlikely. Do to the fun I’ve had and overwhelming response to the truck, I’ve decided to offer it for sale and undertake restoration of an earlier model. If interested, feel free to call me at 816-471-1050. As a side note, the pictures displayed here do not show the visor, which I have and will be installing shortly.